There is a lot of baseball left to be played this year - roughly, half the season. That being said, I made my pick a couple of weeks ago for N.L. Cy Young based on all the games played (pitched) up to that point. While I may or may not change my choice (see who here), I'm back at it to pick his A.L. counterpart. A.L. Cy Young: Zack Grienke, Royals - Grienke got the season off to a perfect start with 38 scoreless innings to begin the season. Although Grienke has hit a bit of a rough patch (losing three of last five decisions), he still leads the majors in ERA (2.00) and is one of only five 10-game winners in baseball. He has five complete games, which also leads the majors. He is second in the American League in strikeouts (120). The Royals recent slide has knocked them 11 games out of first in the A.L. Central and has put them 13 games under .500. In the games Grienke (10-4) doesn't get the decision, the Royals are 23-42. 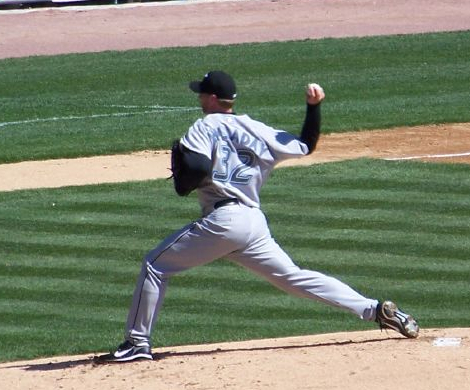 Runner-up: Roy Halladay, Blue Jays - It doesn't get much better than Halladay. He began the season with 13 straight starts of 7 innings or more. In addition, Halladay has thrown three complete games trailing only Grienke. He's one of only five pitchers to win 10 games on the season. He's third in the A.L. in ERA (2.56) and has given up the fewest walks (14) of pitchers who have thrown 100+ innings. Grienke is the only other player with fewer than 20 walks (19)and 100 innings pitched.